This past week the Christian corner of the internet has been somewhat abuzz with headlines like: Gungor drifts from biblical orthodoxy (World Magazine), Dove-Award Winning Gungor Rattles Christian World, (Christianpost) and Singer to Answer for Controversial Views (Breathecast). These articles then go on to accuse the band of “unorthodox theology” leading them to pronounce the band’s “departure from traditional Christianity” and their “wandering away from a biblically defined Christianity." So what are these “unorthodox” and “controversial views” that put Gungor outside of the bounds of “traditional Christianity” and has thus “rattled the Christian world”? Apparently they don’t believe in Young Earth Creationism (that the earth is only 6000 years old), and they don’t believe that all of the stories in the Old Testament should be taken literally (for example the story of Noah and the flood). Really? That’s it? This is what makes them not Christians? “Over the last year, I have had so many questions asked of me about what I believe. Just tonight I had a conversation with someone extremely close to me that said that he wouldn’t consider me a Christian anymore. This gets us into bigger question of what it means to be a Christian, what it means to call Jesus our Lord and savior, what it means to be Christ’s disciple? Is this defined by our holding certain doctrinal formulations like the Trinity or the deity of Christ? Or is it about a relationship with God in Christ shaping our life inside and out, so that we come to treat others with the same grace and mercy that we have known first hand in Jesus? Put briefly, is Christianity about creeds or deeds? Growing up Evangelical, the understanding I learned was always focused on having a “personal relationship with God” centered around a “born again” experience where a person would “give their life to Jesus.” Being in that living relationship, as we pray, worship together, and read our Bibles devotionally, the result was to grow to care about what Jesus cared about, and to have that shape our lives. That experience of God’s love turned my whole world upside-down, and like so many others it made me want to share God’s love with others (evangelism), and to express my love and gratitude to God in worship. 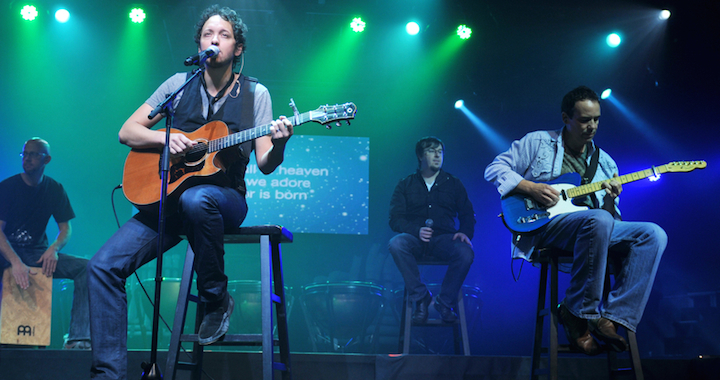 Singing songs like the ones Gungor writes from the top of my lungs each Sunday. That is the face of the evangelicalism I knew, and it is one I still deeply relate to. At the same time there was another face of evangelicalism known as the Neo-Reform movement. This “New Calvinism” is focused on correct doctrine (from the perspective of a 5-point Calvinist) and is often characterized by an embattled, belligerent tone. Think of John Piper or Mark Driscoll and you get the idea. This group focused on declaring who was “in” and who was “out” based on these hyper-Calvinist doctrinal markers (I add the qualifier “hyper” here as there are many Calvinists who disagree with this brand of Calvinism, let alone Wesleyans like myself who certainly do). Now there are two important points to glean from this: First of all, even within conservative evangelicalism there is quite a bit of diversity in regards to what is considered “orthodoxy.” Wesleyans (who were by the way the driving force behind the revivals of the Second Great Awakening that gave birth to American Evangelicalism as we know it today) disagree doctrinally with the Calvinists, and the majority of Calvinists disagree with the New-Calvinists. So the whole idea of being outside of “traditional Christianity” depends on what tradition that is exactly. The fact is, a whole lot of evangelicals, perhaps most even, do not believe in a 6000 year old earth, and never have. I certainly never did. I don’t recall that being part of the sinners prayer or in any of the historical creeds either. Secondly, and more importantly, doctrine can’t be the most important thing about the Christian faith. Love is. Do I believe in the Trinity? Yes. Do I believe in the deity of Christ? Yes. But what really matters is how these beliefs translate into my actions and my life. For example, how does my belief that Jesus reveals God’s character and heart translate into how I love others? That’s why correct doctrine matters, and why when we divorce doctrine from love it is neither correct nor Christ-like. “There are lots of people that have all sorts of beautiful ‘beliefs’ that live really awful lives. If I’m on the side of a road bleeding, I don’t care if the priest or the Levite have beautiful ‘beliefs’ about the poor and the hurting. Give me the samaritan. The heretic. The outsider who may have the ‘wrong beliefs’ in words and concepts but actually lives out the right beliefs by stopping and helping me. That’s the kind of belief I’m interested in at this point. Jesus demonstrates this focus on love as the aim of Scripture (and doctrine) when he declares that the “greatest commandments” are to love God and others. The apostle Paul echoes this as well, saying that the entire law can be summed up in the command to love. Jesus said this in the context of his repeated conflicts with the Pharisees. Paul, himself a former Pharisee, again echoes this same conflict in his contrasting of the “spirit of the law” characterized by love and the fruits of the Spirit with the “letter of the law” which kills. The Pharisees of Jesus time have a lot in common with the New-Calvinists of today. So if we believe that the message of Scripture should be applied to our own lives today, it would behoove us to pay attention to what Jesus criticized about the Pharisees. The Pharisees prided themselves on their “orthodoxy” i.e. on their correct application of the law. Jesus did not fault them on this. What his critique was focused on was that the Pharisees had done this at the expense of mercy and justice. They had shut out the very people who were in need of God’s love. The fruit of their doctrine was not love. It isn’t hard to recognize these same patterns playing out among the New-Reform today—focusing on correct belief with a seeming disregard for whether in doing this they are hurting others, often disparaging ideas like compassion as weak, and speaking mockingly of love. When told that their actions and words are hurtful, rather than repenting they frequently turn to the Bible for a justification of their hurtful actions. These are a group of people who are afraid of being wrong, yet ironically they are deeply wrong in the most important way—in divorcing their doctrine from love. If you look at all the times that Jesus warned people about hell, it is never about false doctrine, and instead always focused on their failure to show love. So if they want to be afraid of judgment, if they want to focus on being “right” then according to Jesus the place to focus is on love. “A new command I give you” Jesus says, “love one another as I have loved you.” That’s how we are “right” with God and Jesus. Now, I do believe it is important to lovingly correct those who are in error for the simple reason that it is not okay to stand by while others are being hurt, especially when that hurt is being done in the name of God. But frankly it is not Gungor—as they wrestle through their own doubts and struggles trying all the while to cling to Jesus and to love—who needs to be corrected. If anything we should thank them for being real. No, the ones who need to be corrected are the “Pharaseevengelicals” of our day who have forgotten that what matters most is love. It is the angry preachers and pundits spreading an anti-gospel of fear and hate who need to be rebuked, rather than passively tolerated to the point where being evangelical has become virtually synonymous with being judgmental and embattled. Some of us are still hoping that the word "evangelical" can again be known for its focus on love and grace centered in a vibrant and life-giving relationship with God. Others have given up on the "evangelical" label and are instead focusing on following Jesus and the way of grace, identifying as "progressives" (or as I do, landing somewhere in the middle, as a "progressive evangelical"). Whatever we call ourselves, it is high time for those of us who desire to live out Jesus-shaped lives to stand up and say to these self-appointed doctrine police that it is simply unacceptable for a follower of Jesus to act in such an un-Christlike manner. Because if we really read the New Testament we can clearly see that a “biblically based Christianity” as it is understood by Jesus and Paul is one focused on the fruit of love. As Paul says, without love, all our doctrine is just worthless noise. With that in mind, let me open this up for discussion: How can we take a stand against people’s hurtful actions, while at the same time doing so in a way characterized by grace and focused on the good of the other? Let’s see if we can practice that in the comments section here. At what point do you draw the orthodoxical line? There are many loving Mormons and Jehovah Witnesses who would consider themselves to be Christian. Are they? If you don't believe in God as He has revealed Himself, aren't you worshipping a god of your own making? Maybe taking a stand is different for each situation. Maybe the stand focuses more on protecting the target than on confronting the aggressor. I'm not sure someone who is convinced they're right and holds views that allow them to treat others wrongly will be convinced by logic. Once again, as you stated, love is the answer. I think a person like this requires a heart experience not a head experience, and the heart experience is God's arena, not ours. We can reflect his love to others, but only he can affect the result. Sometimes, it takes giving a life for love to have its result. Great points Kent. I think that people change because of relationships (heart) more than they do because of arguments (head). There's a limit to how much we can have that online of course. However something that I really noticed about people like Brian McLaren or Steve Chalke was how gracious they were to others, even those who were attacking them. I could of course also name people who are the opposite of this--demeaning, mocking, condemning--and I'm sure you can too. I have to say, there is something about that where those who display grace are more convincing to my head, more compelling, than those who are mean. This is not an "either/or" as if I am saying that we should have love but forget about right doctrine. It is a "how to" where I am saying that doctrine is not correct if it does not lead to love. So I draw the line at love. Love is a command. Correct doctrine is not a command. It can be helpful in that having the right beliefs leads us to be able to love, but doctrine is the vehicle not the end. Love is the end. Correct belief is the means to that end. The point that Jesus made over and over was not that someone is "in" or "out" because of their correct doctrine but because of their love. Look at the parable of the sheep and goats or the story of the Good Samaritan. In each of these he takes someone who is considered "out" based on their beliefs (those who do not say "Lord, Lord" to him in the Sheep and the Goats, and a Samaritan--who would be to a Jew like a Mormon would be to a Christian) and each time he focuses on their love. He says "who are my mother and brother and sister? Those who do the will of God" and what is God's will according to Jesus? "Love God with all your heart and love your neighbor as yourself"
Jesus makes that kind of point over and over and over. So from that I say that a focus on orthodoxy is simply not a focus that Jesus had. We should have the same focus as Jesus. just read your article about ISIS in Huffington Post...really good stuff. “First of all, even within conservative evangelicalism there is quite a bit of diversity in regards to what is considered “orthodoxy”. Absolutely. And people who say that this diversity is over minor/irrelevant things aren’t being honest. As far as I’m aware, there’s no historical creed that links a particular view of Genesis to historical orthodoxy. I mean, Augustine warned about this approach to Genesis 1,600 years ago. There have been and continue to be diverse opinions on science and the meaning of the creation narratives amongst theologians/pastors of all theological stripes. Unfortunately, the response of Gungor’s critics isn’t really all that surprising to me. The response is more fear based than faith based IMO. The fear stems from having a house of cards propositional type faith that can be toppled with the slightest breeze. And from that perspective there is no such thing as a secondary/non-essential idea – every jot and tittle must be defended regardless of the evidence, cost, or collateral damage. Not a healthy way to do faith. There’s really no response that Gungor can give. I don’t really know how to balance out “creeds vs deeds”. I mean, you need both. The amount of scripture that references love towards God and neighbor as what God is interested in seems to be pretty overwhelming. Even that can become a doctrine though – “The authoritative Bible demands that we love our enemies. Faith means we must give mental assent to that doctrine. But we don’t have to do it, that would be works.” I’d say that when understood properly, love is the manifestation of doctrine. I have a younger brother with down syndrome. He’ll never have any concept of the trinity or any other doctrine. And I don’t view him having a disability as a sort of theological loophole where he doesn’t have to believe the right stuff to be “saved” while everybody else does. I mean, is there some kind of IQ limit on this? Not saying that doctrine is therefore not important, but it’s also important to acknowledge that the Christian faith isn’t merely a set of abstract theological principles, no matter how "orthodox". From my experience, it seems love hasn't come from correct doctrine, but just the opposite. I think love is the initiator of correct doctrine. I was what most would consider mainstream orthodox in my doctrine until I had a new revelation/understanding of God as love. I didn't learn this from studying the bible. In fact, I would have told you that God was love, although I was comfortable with his violence at the same time. I'm not sure how I justified love being violent, but I accepted the bible to be infallible and inerrant, so it's just the way it was whether I liked it or not. Somewhere along the line, dissonance over love and violence led me to a place where I was open to questioning my long held doctrines. This dissonance was not brought on by acquisition of some new knowledge, but was a unease that grew inside my heart. So, to me, love was not a manifestation of doctrine but became my a priori for changing my doctrine. True. It should not be either/or. I think Paul nails it when he says “all that matters is faith expressing itself in love” (Hey it’s even Tweetable!). From that I would say that creeds—that is, how we understand stuff like who God is, who we are, what matters, etc—has the goal of leading us to love. They have a servant function of helping us to our aim which is to love. They are secondary. Love is primary. Yes, love should be the result of good doctrine, and also it serves as test for it: If our doctrine does not lead to love, it is false doctrine. Thanks, that’s an excellent point. It is not the chronology necessarily: correct doctrine first, then love. Rather it is the priority: Correct doctrine must lead to love or it is not correct. You are also correct that we often learn love first by experience, and that then leads us to correct doctrine and out of wrong doctrine. That’s been my experience too. The problem with Calvinism as I see it (and this goes all the way back to John Calvin himself, but is certainly true for hyper-Calvinists today) is that the focus is on being right, having an air-tight theology that takes every little jot and tittle of the Bible into account—but the result is a horrible theology that makes God synonymous with the devil: that God is the author of evil, that God is evil. As you said, the way out is to see love is so much better, and to let that love correct the false doctrine of Calvinism. The difficulty then is that the air-tight stuff no longer works. That’s because the Bible is simply not one clear message, it contains lots of conflicting messages, some loving and good, some hurtful and bad. We need to learn to see like Jesus to separate the “wheat from the chaff” in the Bible so we can have scripture lead us to love, and more specifically lead us to Jesus-shaped love.